If you are churro lover (I am!) 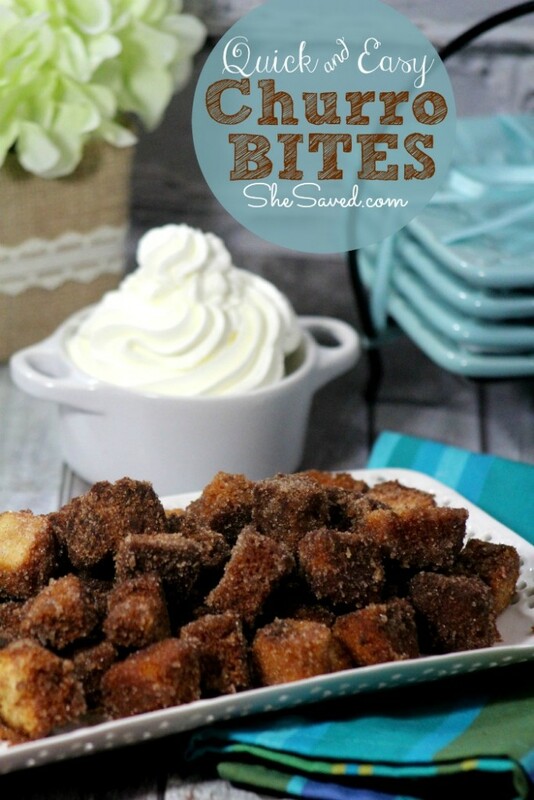 then you will love this quick and easy Churro Bites recipe, it’s an awesome finger dessert and so delicious, especially when dipped into whipping cream. If you make these, I highly recommend making more, than less, because my family devours these, and I always find myself wishing that I had made more. 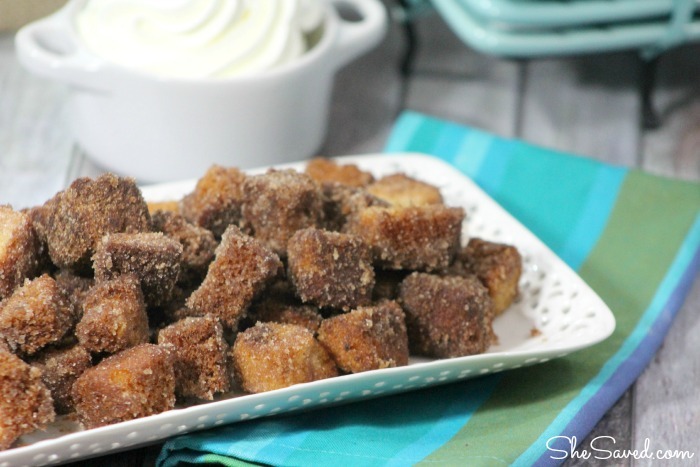 These churro bites also go wonderfully with ice cream and/or fruit topping. You can serve them along with chocolate in the fondue pot for dipping, heavenly! Pour oil into a deep fryer (or a deep frying pan) and heat oil to 375. Cut all of the slices into small squares and put them into a bowl. When the oil is ready gently add about 10 pieces of the cake. Watching carefully, when the pieces are a deep brown scoop them out with a slated spoon. I like to have them crispy and crunchy. If you prefer them less crunchy, then fry only until a golden brown. Stir the sugar and cinnamon in a large bowl. While fried pound cake pieces are still hot, dip them into the sugar/cinnamon mixture and roll around until they are fully coated. Remove from the sugar/cinnamon mixture and place on a paper towel. Once cooled, dip into whipping cream or enjoy plain! Oh my goodness, these look so incredibly decadent!!Yum! Wow those look really good! Yum, yum, yum! Omg these sound amazing!! I don't think I have ever had churros before, but this recipe definitely make me want to give them a try..+ anything with cinnamon has to be good! Wow! Words cannot express how delicious these look right now! I love how easy they are, too. Thanks for sharing your recipe with us at Merry Monday this week! Ooh, I was curious what you used for the base of the churro, and I think pound cake is brilliant. So easy and they look so good! Sounds yummy. Thank you for sharing with us at #HomeMattersParty . We would love to have you again next week.